Wash & clean mushroom. Cut into pieces. Heat oil in non-stick Pan. Add cumin seeds, let it splutter. Add onion & 1/4 tsp salt. 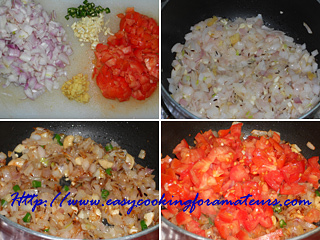 Add ginger, garlic & cashewnuts saute till onion turns slightly golden brown. Add green chilly & tomato. Let the tomatoes cook well. Add turmeric, chilly powder, coriander powder, cashewnut powder & Kasuri Methi. Mix well. Add 1 glass of water or required water for thick gravy consistency. Add salt & mushroom, close the lid for 10min. Add garam masala, stir once. Add cream, slim for 2min. Add coriander & turn off the heat. 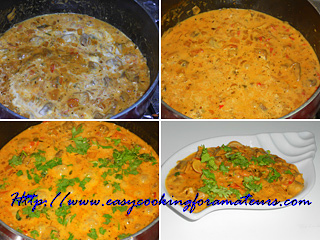 Creamy mushroom masala is ready to serve with chapatti, roti & naan. 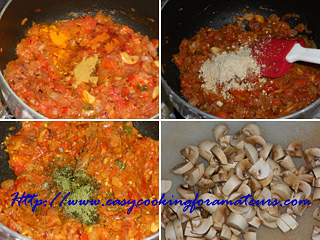 Mushroom Masala looks so tasty and inviting. Lip smacking dish. too good curry creamy n so yummy..
Masala looks yummy. Perfect for mushroom lovers. The mushroom masala looks so tempting..love to have it with some paratha..ur new profile looks very nice..
love to give a try. Creamy, delicious curry...Would love it with some warm tandoori rotis.. Always love a creamy dish once a while. Yours definitely a winner! hi , my first time here. this is a delicious looking creamy mushroom.. excellent for breakfast. Creamy rich curry good with roti. Masala looks incredible,wonderful pair for rotis..
wow, this looks delicious, so rich, creamy n thick gravy..
this looks so rich n creamy....looks perfect delicious!! 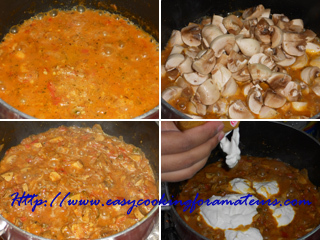 creamy n delicious mushroom masala..I too prepare it in the same way!! 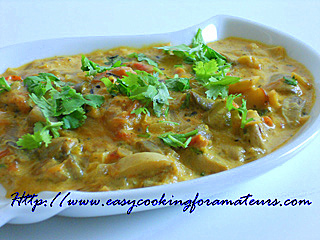 Mushroom masala looks really tasty and creamy. I have read this post. This post is a nice one that information are useful to me..that am here about exclusive south indian food in chennai and exclusive north indian food in chennai . That I will inform about your post to my friends and all the best for your future posts..
@exclusive south indian north indian food in chennai thanks for the comment,do subscribe for future recipes. Love the spicy and delicious dish. Perfect side for chappatis :) yum!!! Please unfollow the previous URL and follow me on my present URL for my latest updates for your valued suggestions and comments on my post ! !Hope you will cooperate..
wowwwww! very beautiful and best flavour! i loce the mushrooms. i like your blog. Following. Thanks for stopping by Easy Cooking For Amateurs and leaving valuable comments and suggestions. Easy Cooking For Amateurs by Madhura Manoj is licensed under a Creative Commons Attribution-NonCommercial-NoDerivs 3.0 Unported License.